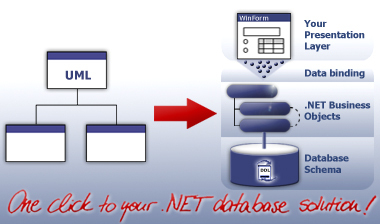 tangible® architect™ generates the object-oriented database access layer of the application and its database schema from within Visual Studio.NET. The object model's specification can be defined in code by means of attributed C# interfaces, use of wizards or by means of an UML-Model. The object model and database schema can be easily modified using the integrated object model browser. Code changes can be synchronized to the UML-Model using round-trip engineering. The generated object model realizes a connection-oriented architecture with a pessimistic locking strategy. It is optimized for data-bound controls. The object-oriented database browser adds additional value to the product. "How the hell does Model-Driven Development work in real-life projects?!" We heard that from several people. If you're wondering, too, please check out our new video tutorials. Getting started with Model-Driven Development has never been easier! News: TA 4.0 now also comes with an own VS.NET Integrated Modeler stating with the Professional Edition. For Power Users the Enterprise Edition also support Enterprise Architect based Modelling . We also changed the packaging and cost significantly to enable resellers to get more money out of a deal and thus be able to do more marketing. Besides Reporting and Web Development are much better supported in the 4.0 version. Executable C# Code - not only signutures!